Funny, engaging, and sharply pointed in his appraisal of the sports complex bankrupting our cities, the celebrated author of A People’s History of Sports in the United States and What’s My Name, Fool? returns with a hard-hitting indictment of the big business that professional sports has become. When attending a baseball game becomes a luxury reserved for the wealthy few and cities build multimillion-dollar stadiums while letting their bridges crumble, the true cost of sports in this country demands reassessment. 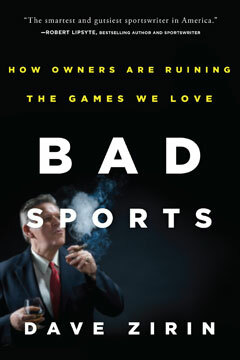 Covering the full range of sports shenanigans through 2011, this revised and updated edition of Bad Sports cuts through the hype and bombast to make the case that sports ownership is as irresponsible as the financial deceit that drove the nation to the edge of economic ruin. From the outrageous use of public funds for stadium construction to the use of these spaces for religious and political platforms, Dave Zirin raises crucial questions about the moral bankruptcy of so many of our politicians; about the real interests of team owners; and, above all else, about where the fun has gone.